The Marriott Waterfront Hotel at Harbor East has accrued quite the water bill: $280,353.52 as of yesterday morning. That’s way down from the hotel’s recent high water mark of $1.45 million as of late last week. Which even with maintenance charges, extraneous fees and interests tacked on, still soaks up a whole lot of indebted agua. News of the tap’s tab was leaked by Tracy Lingo at last week’s meeting of the Board of Estimates, where Mayor Catherine Pugh and her two appointees voted to raise the water rate by 30% over three years. Lingo is the staff director for the Unite Here Local 7 union; they represent hospitality workers in Baltimore, including those at the Marriott. Angered about how the folks they represent allocate about 3% of their income to water while big hotels were filling up for free, she testified about the luxury hotel’s multi-million-dollar bill. Codus did not respond to follow-up questions, including how the bill was erroneous, when the Marriott learned about it, or why she called it “prior” when the figure was listed as “current” in city records. She also did not indicate what the hotel’s plan for resolving the issue would be moving forward. Davis ducked the question of whether the Marriott was issued an erroneous bill. “Not saying that,” he wrote. If the bill wasn’t erroneous, the remediation that’s currently on record will make you question your chicken scratch. 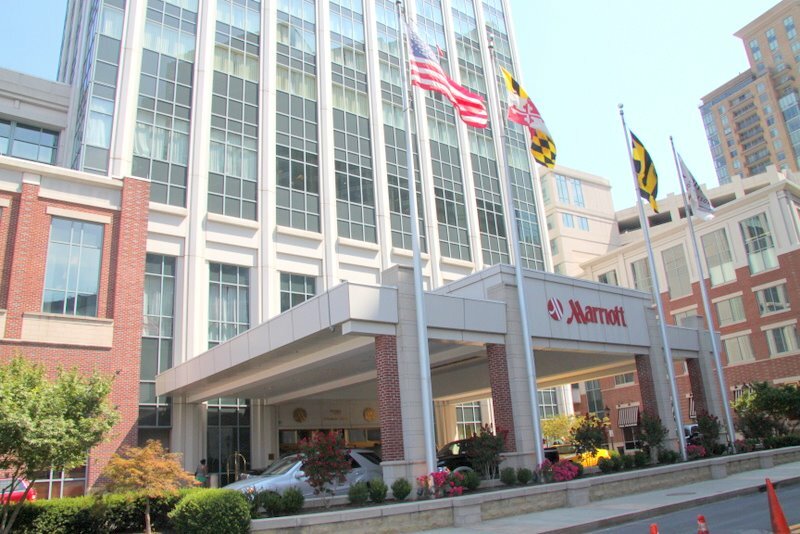 According to the city’s Metered Water site, the Marriott Waterfront made a $71,962.72 payment on January 11, or two days after the Board of Estimates meeting. That knocked the $1.45 million balance down to $280,353.52, or roughly 16 times more than schoolhouse arithmetic would lead one to think. The Department of Public Works, which bills water customers, declined to comment on the steep reduction. The $71,962.72 payment remains an outlier even if the bill was issued in error. The Marriott Waterfront, developed by John Paterakis’ H&S Properties, is one of the largest hotels in the city. It’s one of only two to offer 750 rooms. The other, the Hilton, which is owned by the City, offers 757. The Hilton is located at 404 West Pratt Street. There are three DPW accounts attached to that address. Two boast water bills in the thousands. Neither was higher than $5,500. Indeed, no major hotel’s bill is as high as the amount that Marriott paid last Friday. The highest other water bill on record is Kevin Plank’s Sagamore Pendry in Fells Point. That address holds three accounts; its highest is $65,836.36. City figures indicate no payment has been made there since October 17. Meanwhile, the city says it’s not receiving enough money from water bills to pay for much-needed upgrades and repairs, forcing DPW to again raise its rates. This is the second three-year period in a row in which the city’s brought the rate up by 30%. One year before the 2016 hike, in 2015, the city began shutting off water service to accounts that owed more than $250 and were late on their payments by at least six months. A total of 25,000 residents and commercial users fell in DPW’s crosshairs, with the average overdue bill estimated at between $500 and $600. Reporting from the time indicated that 369 commercials customers were part of that 25,000 tally; together they owed $15 million, nearly as much as the total amount of targeted residents. Such nonpayment by commercial users infuriates Lingo and Food & Water Watch Campaign Director Mary Grant, who point out the broad swath of the city’s lesser earners – anybody making less than $25,000 – that allocates more than 3.6% of their income to water bills, the upper limit set by the United Nations. “The burden will fall on working people,” Lingo told the BOE last week – people who can’t afford a $388-a-night room at the Marriott Waterfront to take a shower.